Use of this website and the purchase of it's products and/or services, constitutes your agreement with all policies and terms contained herein. 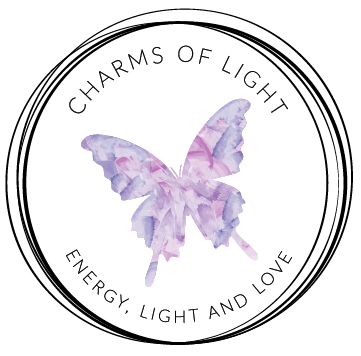 All payments made to Caryl Haxworth ~ Charms Of Light, for intuitive and healing services and/or healing products will be shown as 'Caryl Haxworth / Charms Of Light' on your payment details. Caryl Haxworth ~ Charms Of Light owns the copyright to all of the material and content used on this website, including photographs and designs. You may not copy, reproduce, distribute, republish, download, display, post or transmit any part of this website without written consent from Caryl Haxworth. Everything discussed in an intuitive/spiritual session remains completely confidential by both parties. Any information that you are given is not to be repeated or replicated as your own. Prices are subject to change at any time without notice. If you have bookmarked a webpage for later use, please refresh the page before placing your order to ensure payment of the current price and that the item is still available. In the case of orders being placed from out-of-date pages, I reserve the right to invoice or refund the customer for the difference, less admin fees. For services purchased via the Charms Of Light website, available appointment dates and times will be sent by email. Once an appointment has been agreed, confirmation and full payment must be received, a minimum of 5 days prior to the appointment being held, or at receipt of invoice - whichever is sooner. Please contact me as soon as possible if you are unable to attend your appointment. Refunds for cancelled appointments with less than 24 hours notice are my discretion, less a 10% administration charge. For services scheduled via the Online Booking Service, you will receive a confirmation email once your appointment is booked. Any payment due must be paid a minimum of 5 days prior to the appointment being held, or at receipt of invoice - whichever is sooner. Please reschedule your appointment, or contact me, as soon as possible if you are unable to keep to your appointment. Refunds for cancelled appointments with less than 24 hours notice are my discretion, less a 10% administration charge. In the case of an in-person healing session, if you are too ill to attend, then a distant healing session will be offered instead. In the case of a service being purchased and an appointment not confirmed, there will be 3 attempts made to contact you to schedule your session(s). After this time, if there is no reply, your order will be cancelled and your payment refunded, less a 10% administration charge. Once a class is booked full payment must be received, a minimum of 5 days prior to the class being held, or at receipt of invoice - whichever is sooner. If you wish to cancel for any reason, other than a genuine emergency, please provide me with as much notice as possible. Refunds for cancelled appointments with less than 24 hours notice are at my discretion, less a 10% administration charge. Rescheduling of a class will be at my discretion. Cheque payments will have to be cleared 7 days before appointments/classes are attended. I fully understand that sometimes you may change your mind after making your purchase. In these cases, I am happy to offer a refund, however a 10% administration fee will be charged. This excludes services where manuals have already been sent. I try to ensure that the quality of all my jewellery is of the highest standard. I take great pride in personally handcrafting my designs into beautiful pieces that will not only look good when worn, but also help you to feel good at the same time. As with all semi precious gemstones, there will be slight variations in all the beads used. When choosing your jewellery, please take note of the measurements given with the description of each piece. If you require a different size, please contact me with your request, before placing your order. There will be an additional charge for alterations on all wrongly sized purchases. I wish you to always be absolutely delighted with any purchase made through Charms Of Light. If for some reason, you are not 100% happy with your items, you may return the jewellery within 7 days of receipt. The items must be returned in an unused condition, in its original packaging which must also be undamaged or unmarked. *Please contact me with an explanation of why you would like to return an item as soon as possible and BEFORE RETURNING. You will be offered an exchange, or refund (less a 10% administration fee and the cost of original P&P), within this time frame. I fully understand that sometimes you may change your mind about purchasing something after you have placed and paid for your order. In these cases, if the item has not already been shipped, I am happy to refund your order, however a 10% administration fee will be charged. Buyers are responsible for return shipping costs. If the item is not returned in its original condition, the buyer is responsible for any loss in value. UK returns must be sent by next day Special Delivery service and insured for their full cost. Overseas returns must be sent by International Signed For service and insured for their full cost. Charms Of Light takes no responsibility for goods damaged or lost in transit. All items are quality guaranteed for a period of 12 months from date of purchase. I believe that this is a reasonable amount of time of regular wear to discover any defects in material and workmanship . If repairs are required within this time they will be made without any added cost, except in the case of design changes, and P&P. This guarantee specifically excludes faults caused by accident, neglect or misuse (see 'Everyday Use and Care of Gemstone Jewellery'). After this period a fee for repairs or alterations will be charged to cover materials, time and return postage. Price quotes on custom orders remain valid for 3 days from the date the quote is given. Full payment is required within this time. After 3 days, all pieces put aside for the order will be made available to other customers. A new quote will then be given to cover any costs involved in obtaining new stones/wire etc that may have become out of stock. A small non-refundable deposit may be required on some custom orders. Where a deposit is taken, once an order has been created to the customers' satisfaction, payment of the balance must be made within 3 working days or the item may be added to the website for sale to the public. Cheque payments will have to be cleared 7 days before custom orders are created. My recommendation is that bracelets be at least an inch larger than the size of your wrist. Bracelets made smaller than that are likely to break due to "stress". I am happy to repair and resize for you if problems arise because of this, however a charge will be made for the repair, resizing and return postage. Please note that when requesting a special size, I can not guarantee exact length. Custom sizes come within 0.25 inches of requested size due to variations in stones and designs. I will not be held liable for any loss or damage to your goods in the post, so please choose your shipping options carefully. * I recommend you choose the option that includes insurance, as Royal Mail will not compensate gemstone jewellery or gemstone gift items that are lost or damaged in the mail, without full insurance coverage. In the case of any fully insured package being damaged or lost in the post, I will make a claim of compensation from Royal Mail on your behalf. Once the loss or damage has been confirmed by Royal Mail, and not before this time, a reimbursement of your costs will be made. I appreciate your understanding. Non-insured items will not be replaced or refunded. In the case that your package is unclaimed and returned to me, three attempts to contact you will be made. If there is no response to these contacts, your items will be auctioned and any monies raised will be given to charity. Reposting your returned package will cost the original shipping plus a 10% administration fee. In the case that you have placed multiple orders to the same destination, these - wherever possible - will be packaged and shipped together. Some countries have postal restrictions on semi-precious gemstones and/or jewellery. Please check with Customs & Excise in your chosen destination before placing your order. If you choose to go ahead with the purchase of any item(s) that are restricted, you take full responsibility for any loss if the items do not reach their destination. Once you have made a purchase from Charms Of Light, you will automatically be subscribed to the mailing list, unless you opted out at check out. This list is used to notify you of new products; new blog posts; and special offers and discounts. You can unsubscribe at any time, using the link at the bottom of these emails. All payments are accepted in British Pounds £ only. There are two options to choose from when making your payment. You can make your payment by credit or debit card. I use an SSL Certificate which enables encryption of sensitive information during online transactions. You can be confident that all information given is safe and secure. You can make your payment through PayPal Express. For PayPal account holders, this is a fast and secure way to make your payment by either credit card or directly from your PayPal account. Please be advised that when choosing PayPal Express to pay for your order, the correct shipping location must first be chosen. If it is incorrect, you will be charged the difference (plus a 10% administration fee) for the correct shipping costs. If you live in the UK, you can also choose to pay by cheque in GBP £ only (details will be sent on completion of your order). Please note that cheques will need to be cleared before dispatch of your order which may take up to 7 days. From time to time I offer special discounts and promotions for healing products and services purchased from this website. Any discount codes, when provided, must be used in conjunction with sales and offers as advertised. I reserve the right to disallow any discount if the correct code is not used.